Our house is spacious and has an open layout where it looks like we have a big kitchen. However, compared to how much I use my kitchen and number of the tools and utensils I use, we have very limited counter space and cabinets. Not only do I have to be very selective in what I store in my cabinets, I also have to be very efficient in organizing and storing those items. 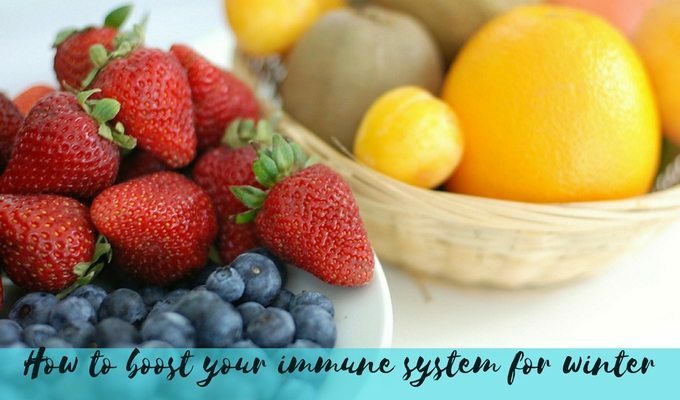 Otherwise, I dread opening the cabinets to get something out of disorganized stacks of pots, plates, and cups. 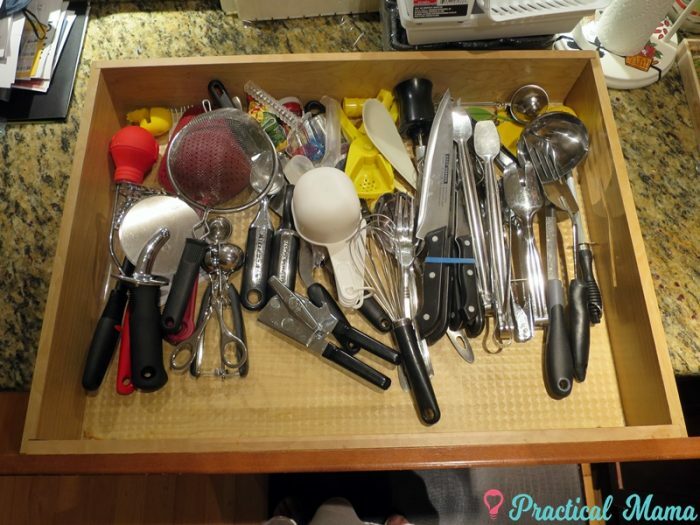 Over the years, I organized my kitchen cabinets and drawers to make the most of the available space, keep utensils neatly in place in drawers, find the spice I need right away. 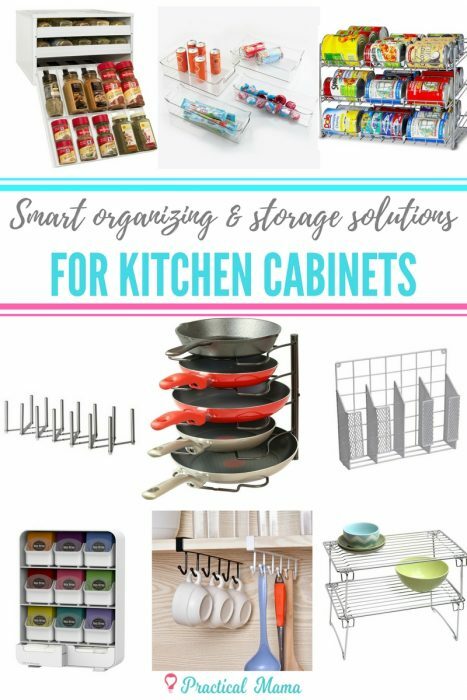 With these smart organization and storage ideas for your kitchen cabinets and drawers, you will be able to fit more and easily locate what you need. Pot and pans are the most used, biggest space occupying and the most cumbersome items in the kitchen. I store mine in a corner cabinet with a lazy Susan. I organize pots and pans by their size and protect them with these felt pads from scratching each other if I stack them. my pot lid organizer which is in the photo above. 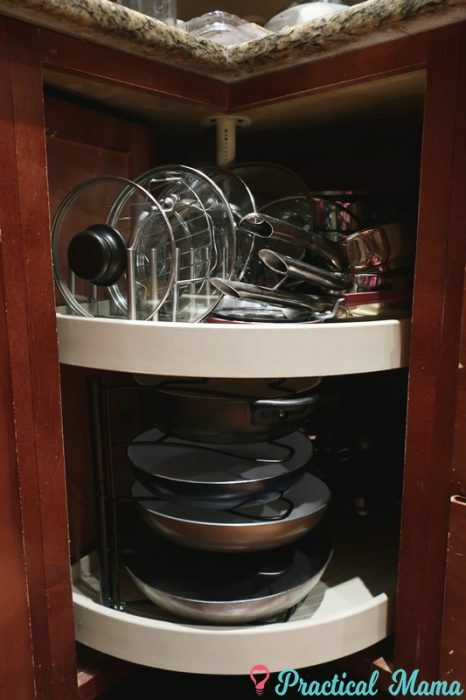 Lids are a hassle and this rack keeps them organized. 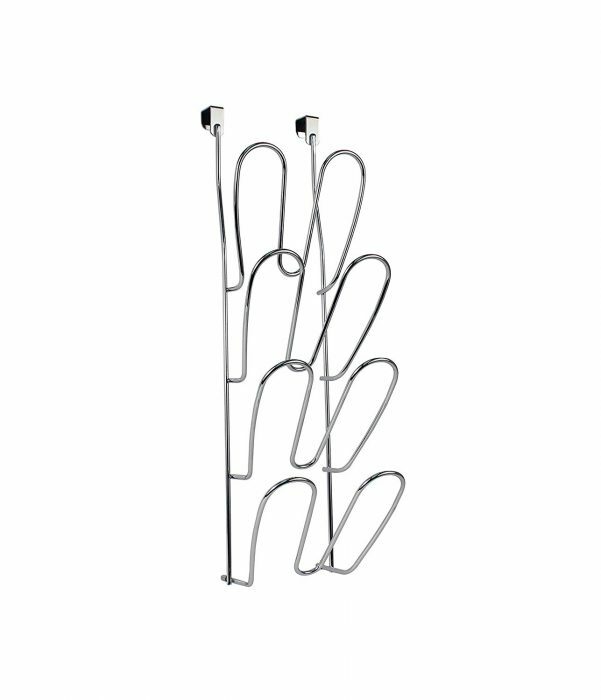 The rack is adjustable in size, so you can fit to the space you have. It stores up to 6 lids. I also store my steaming rack in there as well. and my Kitchen Cabinet Pantry Pan and Pot Lid Organizer Rack Holder which is also in the photo above. 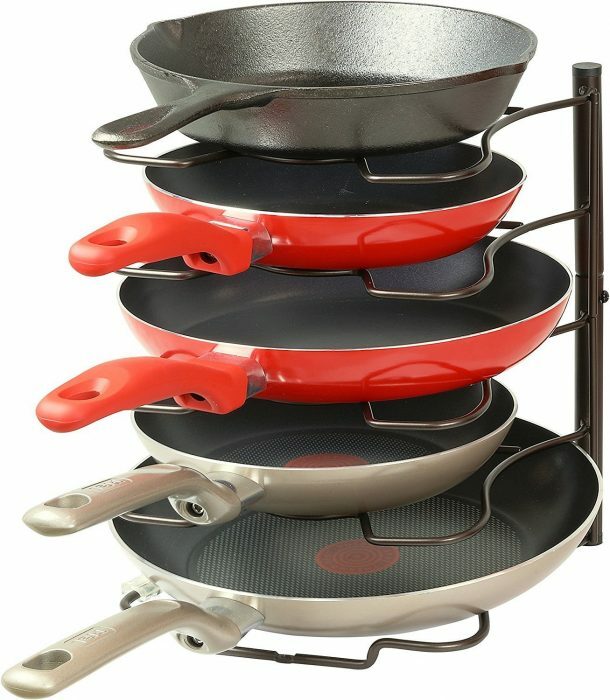 It’s easier to store the pans I use the most in this organizer rack rather than stacking them. 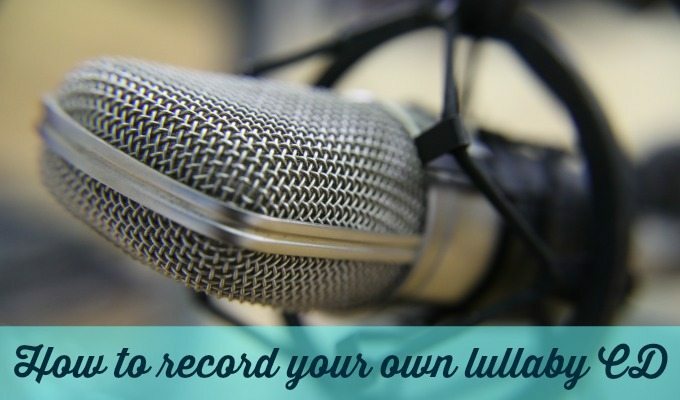 I can reach out and grab or put it back without hassle. It also protects my ceramic covered pans. Stacking pot and pan lids and trying to balance them only to have them fall down is one of my biggest frustrations in the kitchen. 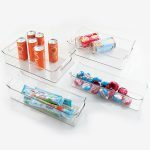 I don’t use many cabinet doors for storage but this over the cabinet lid organizer is a great space saver and organizer to keep the lids stored separately. My utensil and tool drawer was the worst. Everything was stacked on top of each other and every time I opened the drawer, everything shifted. After using grid organizers, I have one layer of utensils organized by size and everything stays in place. 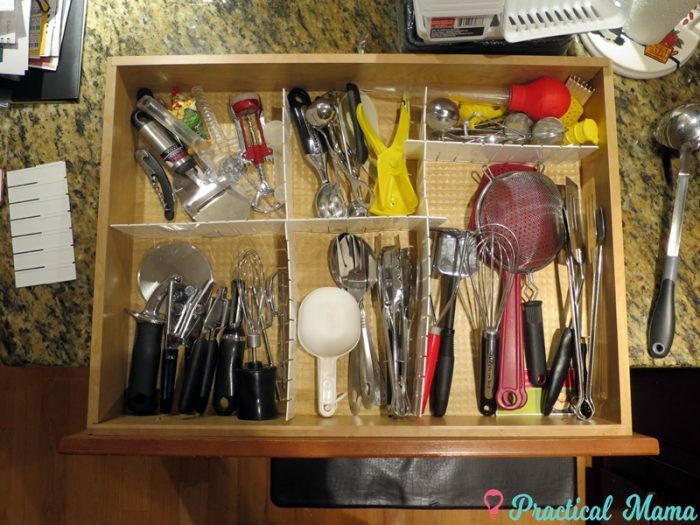 This is the grid drawer divider I used in my drawers to organize kitchen tools and gadgets. You can see that it’s very versatile. 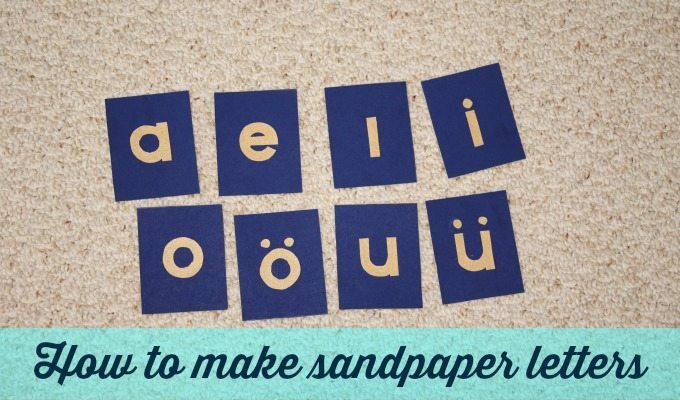 You can cut and shorten them to fit into your drawer in any configuration you want. I used tac removable adhesive putty at the ends to secure the grids onto the drawer. This is another drawer divider organizer I use in another drawer. Its length is adjustable and is very sturdy. 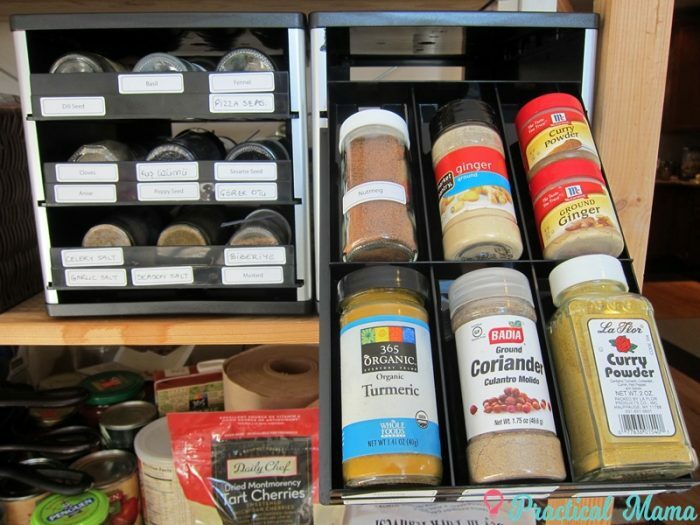 I have shared these spice organization ideas on my blog before. I keep my most used spices in a hanging slide-out rack. I keep the other ones in this spice organizer with drawers. 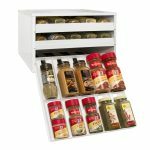 I use a lot of herbs, spices and seeds so I have 2 of these spice organizer drawers. They fit into my pantry shelves. I labeled the shelves, so I know which one is where. I also put the rectangular spice bottles here. 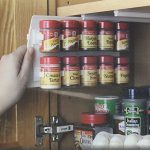 This Organizer Spice Rack is a great solution for small cabinets. It is a slide out rack and you can use the height of your shelf. The only disadvantage is when your favorite spice brand puts their spices in rectangular bottles. I have empty cylinder spice jars into which I transfer to put in this organizer. I store the rectangular ones in the spice drawers above. 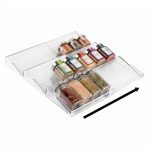 If you have enough drawer space, this spice organizer for drawer is also a brilliant idea. 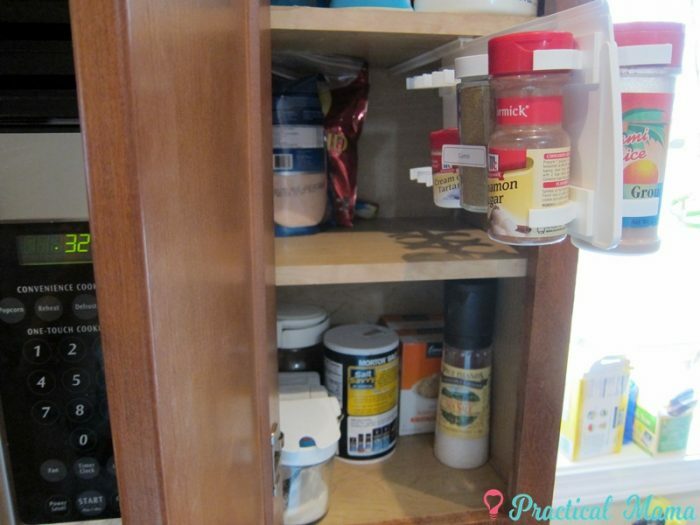 You can keep all your spices visibly organized and easy to reach. I am a tea person and have all kinds of herbal and fruit teas. Storing them in their boxes is very inconvenient. This tea bag organizer makes tea bag less frustrating. No more stacking the boxes and cutting a hole in the front, so that you don’t have to open the box every time you get a tea bag. If you keep less variety, you can get a smaller 6 tea bag organizer as well. 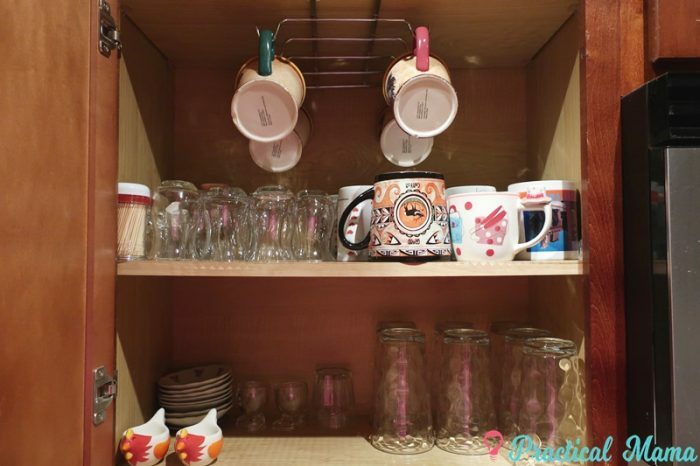 Who has more mugs than they can fit in their cabinets? 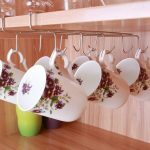 These undershelf mug hooks utilize the empty space in your glass and mug shelves and you can fit more mugs and cups. 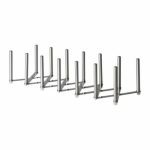 You can also get a single row of mug hooks. 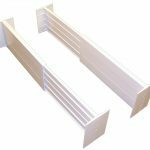 These stackable cabinet shelves are another solution to use the height of your cabinet shelves and store your glasses, mugs and cups. 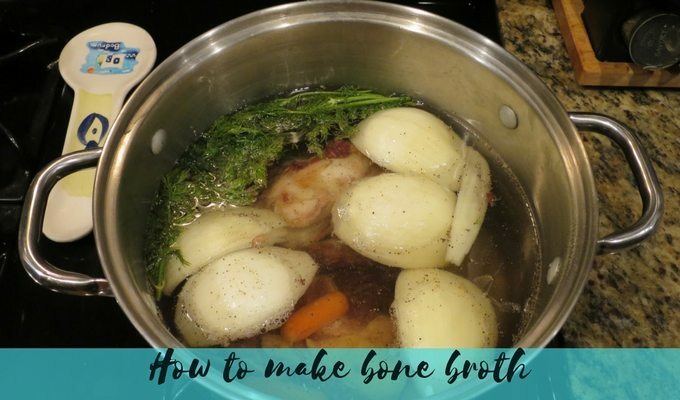 You can use them for plates and bowls as well. 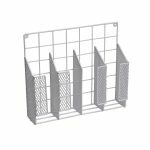 Similar to undershelf mug hooks, undershelf basket utilizes the height under your shelves. 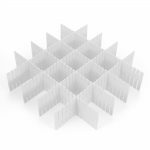 you can use these for smaller cups, saucer plates, egg holders and other small plates. Pantry cabinets used to be the black holes in our house. This is where my husband and kids couldn’t find the cereal box or nut butter even if it was in front them. Without a logical organization, it’s the deathbed of snacks and canned food. I purchase cereals in bulk when there are deals. Then I only take out few and oatmeal and fill these Cereal containers and keep them out for consumption. The rest is stored away. It helps us avoid the annoying case of boxes with little cereal left at the bottom of the box. 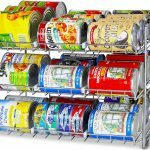 This can rack organizer not only great for being able to store more cans in your pantry cabinet but also allowing you to fill from the back and use the oldest one first. 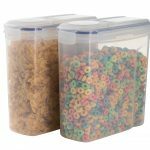 I use these organizer bins for food storage both in my pantry as well as my refrigerator. 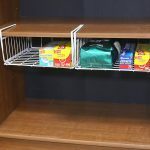 You can pull out and get what you need even if it’s in the back of the bin when cabinets or shelves are full. 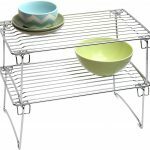 Measure your cabinets or refrigerator before making your purchase because organizer bins for pantry are not adjustable in size. 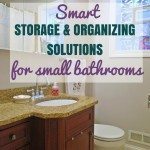 If you read my post on storage solutions for small bathrooms you already know that I love over the cabinet door storage. 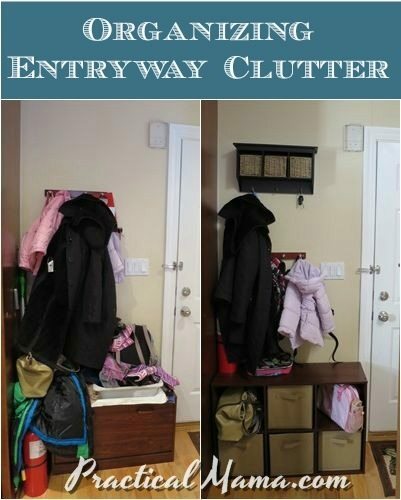 There is every variation of over cabinet door storage and over cabinet door organizer. 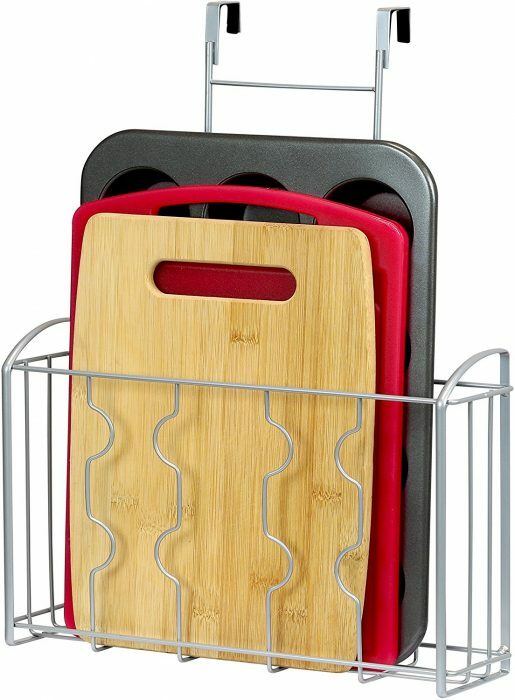 You can store cutting board and baking pans, wraps, and rolls of sheets. 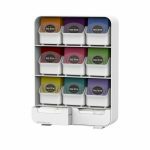 This is a different type of wrap organizer which you can screw inside the cabinet door if you don’t like the hanging hooks. 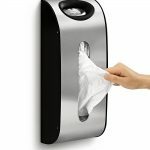 The last storage idea I use both in my kitchen, as well as bathrooms, is this grocery bag dispenser. I use canvas and reusable bags when grocery shopping as much as I can, but sometime I get plastics bags. 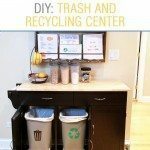 We reuse small plastics bags in our small trash cans and this is a great way to store them and pick one whenever we need.